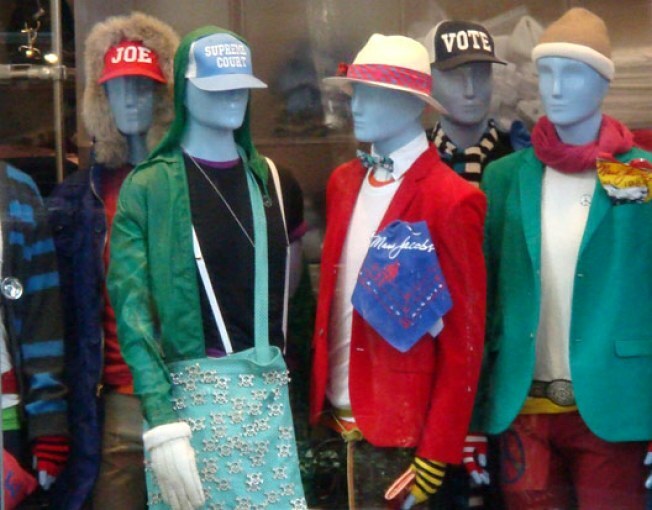 It's go time for politically-themed store windows, especially when it comes to ones taking a side in the election. Remembering the leanings of our old friend Marc Jacobs, we checked out his men's store at 382 Bleecker Street, only to discover more political hats. These, however, are far more vague than the "Biden" and "Obama" hats of his women's store window; these simply say "Joe," "Vote," and in a show of randomness, "Supreme Court." Since this has been a campaign of various Joes, who does Marc mean with these hats? Is he rooting for Joe Biden, Obama's running mate and the original Joe? Or it is Palin's favorite "Joe Six-Pack," who arguably could pull off Marc's clothing but not afford it? We're thinking it instead references Joe the Plumber, in Marc's attempt to show that it's ok for even regular dudes from the Midwest to wear his clothes and vote democratic. Nonetheless, the hats are still not for sale at Marc Jacobs' stores.